This is my first attempt at a blog. I enjoy reading other peoples blogs and enjoy looking at the challenges other people enter. I enjoy crafts of all descriptions but tend to make cards, scrap-book pages and models from Fimo. I also enjoy baking and as I don't have many photo of the cards etc I have made I am going to show you a couple of cakes I have made over the years for my children. This is a joint effort with my Star Wars obsessed son. 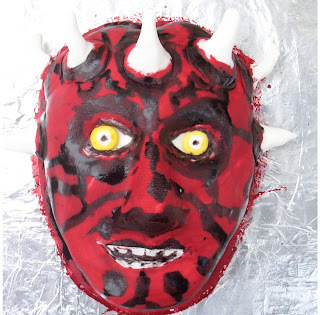 This is a Darth Maul cake we made together I made the cake face and put the icing on and Rancorman (alias my son) did the face painting. 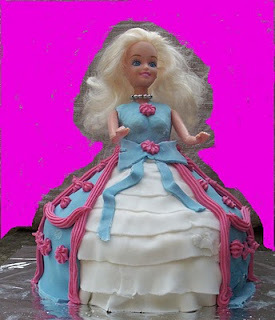 This little beauty was one I made for Padme's (alias my daughter) 5th birthday. 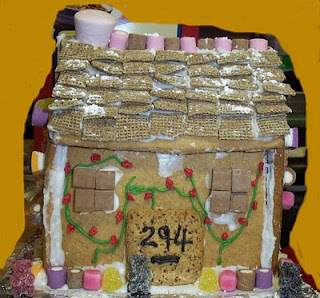 I made 4 of these as Christmas presents because in late 2003 and early 2004 four of my friends were either moving or having major work done on their house. It took me ages but I enjoyed every minute as I knew they would be chuffed to receive them. I am going now to take some pictures of my scrap-book pages. Hope everyone had a good New Year's Day and has a Happy 2010.